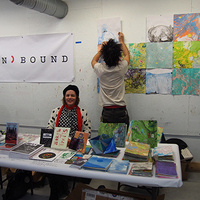 RISD un*bound is a day-long event celebrating artists’ books, zines and experimental printed matter created by RISD students and faculty as well as local artists, designers and publishers. Through exhibits, sales, speakers, discussions and workshops, RISD un*bound seeks to inspire conversations about cultural publishing in the Providence community. After a successful inaugural year, supported by RISD CSI in April 2017, un*bound will return for a second year! The fair will take place on the first floor of 15 West, in the main hall and library, with convenient access to Portfolio Cafe. Un*bound will hold an open call for exhibitors in early 2018. During the application process, exhibitors will be able to suggest topics, people and/or formats for programming during the fair, helping to shape the event to match participants' interests. Last year's fair hosted 60 exhibitors and attracted approximately 450 attendees.